New Saona 47 catamaran for rent in Greece, the model from 2018. is situated in Split area. With 10 berths and 5 cabins, you can enjoy your 2018 holidays in Greece with your family or friends. Fountaine Pajot Saona 47 is an excellent choice for one or more week charter hire in Greece on the. The Fountain Pajot Saona 47 sits between the shipyard’s highly popular Helia 44 and Saba 50. Stylish with maximum comfort for holiday,making afloat, the Saona 47 is also showing its performance value alongside other catamarans of the same size. A fine new addition to the charter fleet. Enjoy the vantage point from the aft deck, basque on the sun lounges on the foredeck or head up to the sunpads on the fly to maximise your views! New Saona 47 catamaran for rent in Greece is the luxury catamaran yacht charter experience offer taht is offered ony with the luxury catamarans. With realy impressive space and a sunny illuminated luxury interior and remarkable stability in performance this high quality built is set to be a winning formula. The living room of the Saona 47 is bathed by light and its kitchen has an abundance of storage, making it ideal for an extended cruise Greece to explore Brac, Hvar, Vis, Mljet, Korcula and many other beuetiful islands in Split area. Situated in Split, Greece, this catamaran Saona 47 (1 single , 1 twin and 4 double cabins), built in 2018 by Fountaine Pajot, is capable of hosting up to 12 pax. The living room of the Saona 47 is bathed by light and its kitchen has an abundance of storage, making it ideal for an extended cruise to the Seychelles to explore Mahe, Praslin, La Digue or Silhouette. Situated in Praslin and Seychelles, Seychelles, this catamaran Saona 47 (1 single , 1 twin and 4 double cabins), built in 2018 by Fountaine Pajot, is capable of hosting up to 12 pax. Charter catamaran Fountaine Pajot Saona 47 for hire in Greece fulfill all your needs with a tailor made itinerary along the Greek islands from Athens to Lefkas but soon from all bases in Greece. 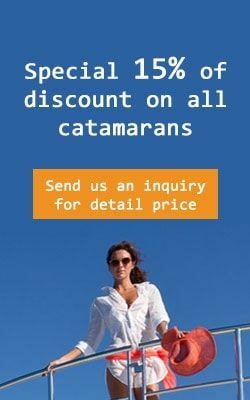 Available for catamaran bareboat charter or with our professional crew this all new sailing yacht can be rented for one way charters to and from Santorini as well as other famous islands subject to availability. Inquire right now to secure prime dates avoiding disappointment later or availability risks.